Designed primarily to operate medium-pressure Ultraviolet (UV) lamps, Shape has long been recognized as the design/engineering leader of electronic controlled transformers that regulate the output current to assure constant power. These extremely efficient controlled transformers are widely used in the UV curing and water purification industries, where they help maximize the critical UV spectrum of the lamp’s output, while at the same time extending lamp life. By being able to control ballast output you’re able to meet your manufacturing process and flow requirements. For UV printing and UV curing, this means improved quality control of the curing process. Shape is also the leading domestic manufacturer of ferroresonant based Constant Current Regulators (CCR) for airport runway and approach lighting applications. Our designs are compliant with the FAA specification AC:150/5345-10. These CCR’s are robust, single core magnetics that are extremely reliable and can be counted on to meet the mission critical task of landing all aircraft. Following are several reasons we believe you’ll want to use Shape’s electronically controlled ferroresonant ballasts and constant current regulators. High spectral efficiency results in greater UV output/watt input for a more efficient curing process. Reduced infrared emissions and cooler temperature around the UV lamp provides a safer environment for heat-sensitive substrates. Continuously variable output power maintains lamp intensity, and unreliable mercury relays can be eliminated. In addition, output power can be set manually, or controlled with PLC. Once the output power is set, it will maintain constant power to the lamp within 2% of the target value over the entire input voltage range. Mercury vapor, or metal halide, lamps can be used interchangeably with our CFB’s. 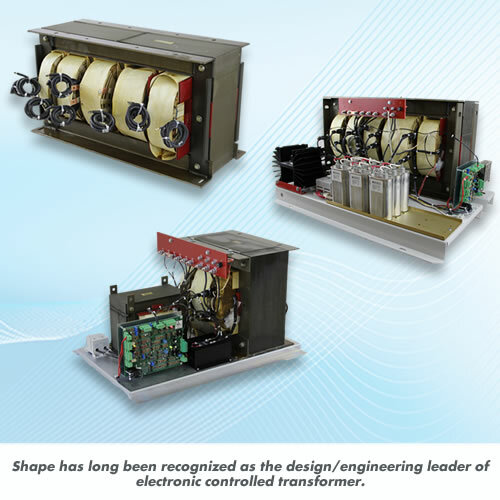 Shapes controlled ferroresonant transformers provide the fastest warm-up available. Our CFB’s are designed to that short circuits will not damage your system, resulting in longer life. Controlled Ferro-resonant transformers from Shape, one of many reasons we’ve become so well known as the provider of Innovative Transformer Solutions.